Being a perfect blend of traditional style and modern design, these burners are an ideal gift for your friends and family. 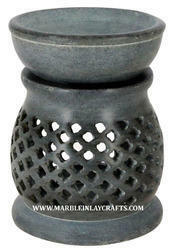 We offer attractive Soapstone Incense Stick Burners that are available in a variety of designs and patterns. Manufactured from the superior quality raw materials, our Soapstone Incense Stick Burners are cvarefully craftsd by our painstaking professionals . Incense Stick Burner provided by us are a perfect blend of beauty and utility. Our Arabic Incense Burners also add an unmatched look to the interiors. We are well reckoned as one of the overruling Incense Burners Manufacturers and Suppliers based in India. Our range of Incense Stick Burner, is available in different shapes, sizes and designs that are as per the client’s preferences. Being a prominent manufacturer, we are engaged in designing and supplying the best quality of Soapstone Coasters, which is designed using the superior quality of raw materials. Each unique Soapstone Coasters is beautifully handcrafted, richly polished and lined with protective felt. Valued for centuries for it’s natural beauty, strength and durability. We present our products in different colors and shades and their cost also depend on that. The designs of Soapstone Coasters are designed by our designers who always think different ideas to satisfy the needs of our clients. Before, we supplying these products we investigate them properly so that our clients will be satisfied with our products. As one of the leading manufacturers and suppliers in this domain, we offer our clients a broad range of Soapstone Incense Tower, which is used for holding incense sticks. Made from superior quality Soapstone, these towers are designed and build in different shapes as per the requirement of clients. Being a quality conscious organization, we manufacture and supply a fine quality range of Soapstone Tea Coaster Set, which are available in different designs and patterns. Our products available at market leading prices to the clients. These products are manufactured using quality tested basic materials sourced from the trusted vendors. Further, we offer our products as per the industrial standards to the clients. We are one of the foremost manufacturers and exporters of a spectacular collection of Soapstone Coasters that are appreciated by our clients for their innovative designs and durability. These are widely used to keep some precious things in homes and offices. Further, our clients can avail these Artifacts at leading market prices.Our unique collection of Coasters is available in various sizes and different color combinations as per the requirements of our clients. Our customers can avail a wide variety of Stone Aroma Lamps provided by our experts in various patterns. Designed with traditional arts, these Aroma Burner present unique mix of artistic designs and fascinating patterns. Made from high quality soapstone, our exotic range of beautiful Aroma Diffuser can be tailor made as per our clients’ requirements. 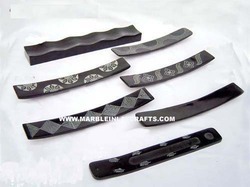 We are a leading manufacturer and supplier of a wide range of premium quality Black Soapstone Incense Holders. 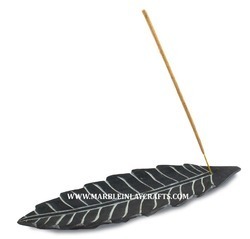 We offer a quality range of Black Soapstone Incense Holders. These are fabricated using high quality black soapstone along with beautiful design carved on it that adds extra glory to the beauty of our product. We can also make any custon design as buyer's requirement and suggestions. We are one of the leading retailers, exporters and suppliers of Soapstone Painted Jewelry Box to our clients in both the domestic and international markets. These feature an inlay art which is one of the exotic arts put on Marble Stone to give it a marvelous and exquisite look. Being a minute art, every precaution is taken by experienced craftsmen to create flawless and sophisticated designs. These are procured from our reliable vendors whose workmen create these Boxes with patience, endurance and hard work. pashan kala craft their Incense Stick Stand made with high quality soapstone, unique shades and on unbeatable price range. Incense Stick Stand, we made are well finished and shows the quality of our workmanship. 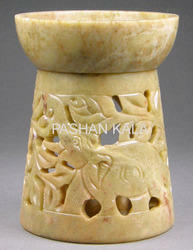 These soapstone Incense Stick Stand are available in various designs. 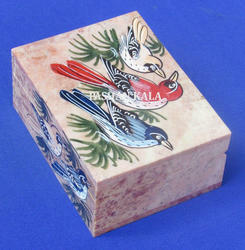 Pashan kala provide a prominent supply of these Incense Stick Standr . We are manufacturing and offering enchanting and latest trends with this new range of decorative Candle Holders. Perfect finish and classy polish further enhances the worth of the range that is highly demanded in the market.Our exquisite range of Soapstone Candle Holders are well known charming effect in the living rooms, bed rooms etc. These beautifully crafted candle holders have always been a favorite among our clients for its unique combination of aesthetics and durability. These Candle Holders are available in various sizes and specifications. Our candle holders can be availed at industrial leading price. We are the reliable manufacturer and exporter of Candle Tea Light Holders. Our wide assortment of Candle Tea Light Holders is gracefully designed to capture the buyer’s attention. This Candle Tea Light Holders is appreciated for its light weight, attractive shapes and designs. 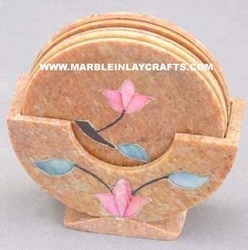 These Holders can be used for home décor as well as for gifting purposes. These Candle Tea Light Holders can be customized as per our precious customers specifications. These Tea Lights are widely known for its durability and quality. Our Tea Light Holders can be availed at industrial leading price. Royal Elephant can be purchased from us at market leading price. These Soapstone Carved Elephant are carved using high grade marble and provided an exquisite finish by our talented craftsmen. These can be used as elaborate show pieces or gift item for momentous occasion. 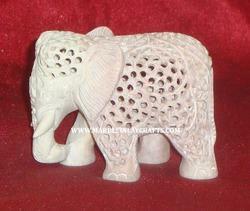 Our range of Soapstone Carved Elephant in demanded throughout the country and abroad. 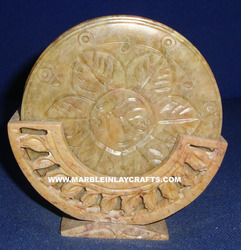 We are manufacturer and exporter of a wide variety of soapstone coasters set. 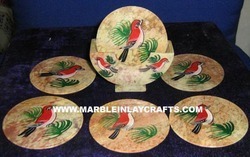 These Soapstone Coaster Set are handcrafted in soapstone and decorated with beautifully painted Birds on each of them. They are uniquely designed in different shapes and patterns. Well polished and with fine finishings. Soapstone coaster set is the ultimate choice for providing a sophisticated look to the dining area. Stone coaster set we manufacture is obtainable at affordable prices. 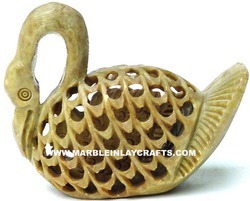 We have earned expertise in offering skillfully crafted soapstone duck Statue, which is available in magnificent designs and sizes. This is meticulously crafted by experienced artisans, who hold expertise in designing these artistic pieces. Owing to its unique designs and high aesthetic appeal, this statue is widely demanded by our customers. This product is widely availed by our clients due to our compliance with the latest trends in the industry and the highest standards of quality and reliability. 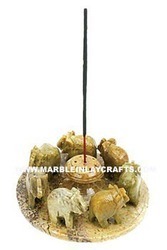 Being industry leaders, we offer a wide range of soapstone incense burners. 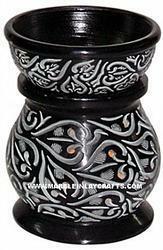 Our team of skilled Indian artisans provides Designer Handmade Incense Burner. They are made by using Natural Soapstone. It is also available in different shape, size and design as per our client's specification. These are fabricated with premium quality raw material in order to provide long service life and good functionality. It is also available at market leading prices and we deliver huge stock of fragrance burners to our esteemed clients on time with out fail. Owing to our modern manufacturing unit, we are able to offer Soapstone Oil Warmers. Our range is meant to odorize the atmosphere pleasingly. These warmers are excellent in quality and are also used to add elegance and charm to the interiors. Our range is appreciated not only for beautiful carving designs but also for optimum utility and cost effectiveness. 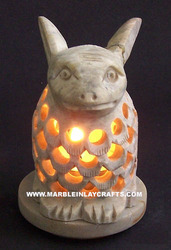 We procure a complete range of Handmade Soapstone Oil Burner in different shapes and sizes. Our experts pay attention to each and every detailing done on these Warmers to provide exclusive products as desired and appreciated by our global clients. Being a perfect blend of traditional style and modern design, these burners are an ideal gift for your friends and family. Looking for Soapstone Handicrafts ?